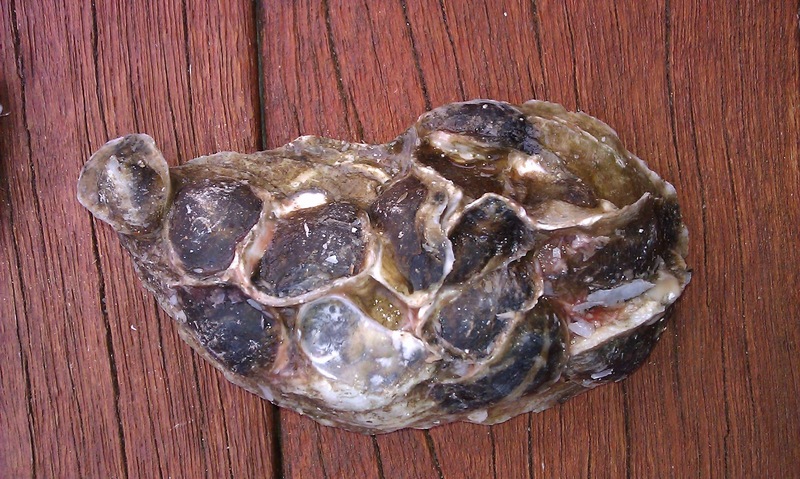 It has been a busy few weeks for Mass Oyster, finishing up with an exciting weekend at the Wellfleet Oysterfest. Above we have a photo of Curt Felix in among the shell to be recycled. It was an impressive site and it is back in the water. The program is well organized and impressive. Below are some statistics. · Over 1 million spat returned to the water due to Commonwealth waiver the last 2 years!!! Many of the shells had multiple spat on the surface that were still vital. By returning them to the estuary we give those spat a chance to grow, filter water and eventually reproduce themselves. 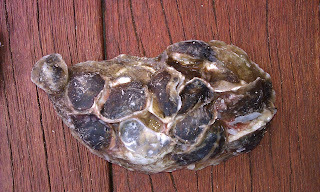 Oyster shell with spat attached. Our booth was well-staffed with a new innovation of a tent for the rains on Sunday morning. We had strong traffic made many new friends and even sold out of certain t-shirt designs. Theresa Baybutt in the booth with our new banners. The popular oyster/lobster cut-out was well used by the thousands of people who attended.